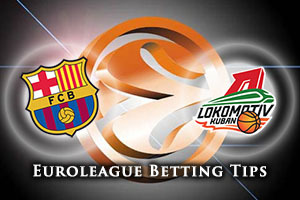 This is shaping up to be a cracker in Catalonia as FC Barcelona Lassa welcomes Lokomotiv. This is a game between two sides that have great defensive records and while the hosts can boast of a 3-1 record so far this season, the team from Krasnodar are on a 4-0 record and they will be looking to maintain their 100% start. Barcelona can be proud of being the fourth best ranked defensive team in the league (giving up 68.3 points) but the away team is the second best defensive team, giving up just the 68 points per game. However, there is a great level of attacking prowess in the Lokomotiv side which means that there is a need for the Catalonians to be stronger at the back while being smarter up top. The size advantage offered by Ante Tomic could play a part and Samardo Samuels will need to get involved with the game and push the hosts forward on Thursday night. Lokomotiv have plenty of strengths but they lag behind Barcelona when it comes to turnovers, so this could be an intriguing part of the play. Malcolm Delaney has been in excellent form this campaign, averaging 18.8 points per game, making him the third ranked scorer in the Euroleague. The loss of Anthony Randolph could be a blow for the away team but with players like Dontaye Draper involved, it is not as though Lokomotiv are stuck for quality options. Evgeny Voronov is coming into this game on the back of grabbing a 15 point career high and he will be determined to leave his mark on this game. Even though the away team has a perfect record, the bookmakers believe the Catalonian side will have more than enough about them to seal the win at home. Take FC Barcelona at -7.5 with odds of 1.90 in this one. If you are keen to take advantage of the Over/under market for this game, look to go UNDER 151.5 at odds of 1.90. Bet Now!